Checkboxes and Radio Buttons are very similar. They both display a list of options which a user can select from. Checkbox fields allow the user to select one or more options and boxes can be checked and unchecked. 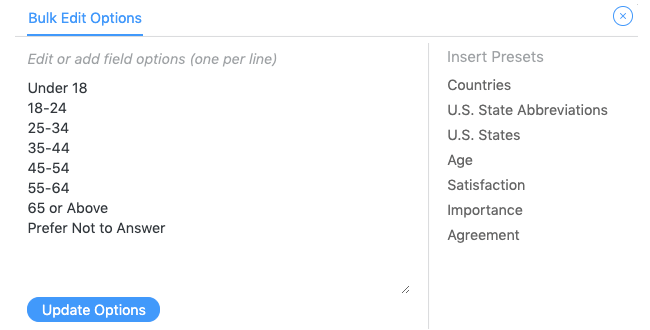 Radio Buttons fields will allow only one option to be selected. A Radio Button cannot be unchecked. 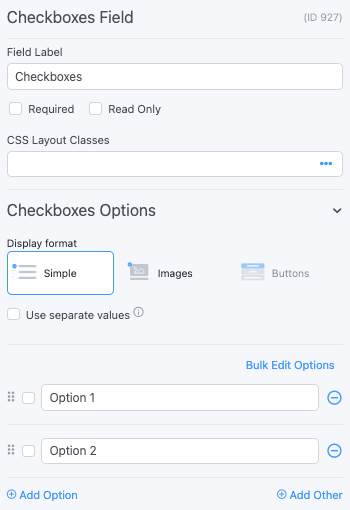 In addition to the standard field options, Checkbox and Radio Button fields have several field-specific options. Browse the sections below to learn more about the options specific to Checkbox and Radio Button fields. By default, the option alignment is set to 'Multiple Rows'. If you would like all the options on one line, change Alignment to 'Single Row'. 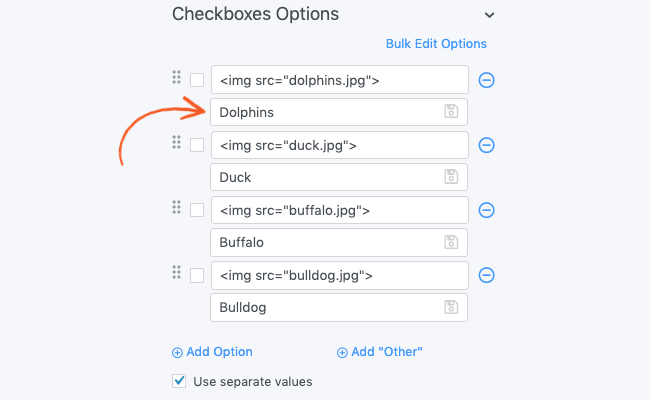 Set a dynamic default value in your Checkbox or Radio Button field. If you would like to retrieve a value from an entry see the Get a Value From an Entry page. If you would like to set a default value, see the Default Values page. Note: Do not leave the saved value blank on a radio or checkbox option. When the value is blank, it will be checked by default when the form is viewed, and there is no way of knowing if the user selected the option or not. Some checkbox and radio field-specific styling is available in 'Formidable' → 'Styles' → 'Check box & Radio Fields'. You may adjust the styling of your option labels and adjust the default option alignment. To learn more about styling your form see the visual form styler page. If you would like to add images to a Checkbox and/or Radio Button field, follow the directions below. Add options until you have as many as you need. In the field options, select Use separate values. In the 'Saved Value' column, insert a text value. Save the form and click Preview. Now when the form is visited, it will show a list of images. When an image is selected, it will save the text value of that image. See how to replace radio buttons with images in WordPress forms in the blog for an example with CSS. If you would like to display your Checkbox or Radio fields in a grid as shown below, see how to create a grid. Once you have a grid set up, you may add labels to the grid. If you would like to modify an individual Checkbox or Radio Button option, see the edit radio/checkbox options section. If you would like to hide your Checkbox or Radio Button option labels, see the hide option label section. Do you have an existing terms and conditions page on your site that you would like to link to and require agreement from within your form? I agree to the <a href="URL_of_your_terms.com" target="_blank">user agreement terms</a>. In the field settings, mark the field required and set the label position to "none". Select the "save separate values" option and change the saved value to something without HTML for best results ie "I agree". If you would prefer to include the terms within the form, read more about how to create a terms and conditions field. Display the value submitted in a Checkbox or Radio Button field in a form's confirmation message, email, or View. Display submitted options: Display the value submitted in a Checkbox or Radio Button field. Replace x with the ID or key of the Checkbox or Radio Button field. Separator: Use a different separator for Checkbox field values. By default, this will be a comma. Replace x with the ID or key of the Checkbox field. until you have separated out each option in the field. Then you can add any text you would like between the options. Where x is the field ID of your checkbox field. Dynamically populate checkbox fields with the frm_setup_new_fields_vars hook. Order field options with the frm_setup_new_fields_vars hook. Add user list to checkboxes or radio buttons with the frm_setup_new_fields_vars hook. Require a minimum number of checked values with the frm_validate_field_entry hook.